Bulls ready for Korver? Best ever shooter? Will the Bulls be looking at immortality Saturday when they play the Atlanta Hawks at the United Center? Will the Bulls be defending the greatest shooter in the history of the NBA, Kyle Korver? It’s certainly a debatable issue given the various criteria to rate shooting in the NBA. But no one can claim what Kyle Korver can. 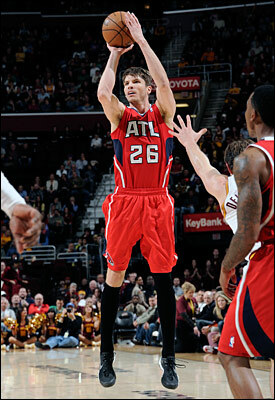 Korver has made a three-point shot in 102 consecutive NBA games. And no one in the NBA is officially even close anymore since the former Bull blew by Dana Barros’ 89 several weeks ago. But does that make Korver the best shooter in the history of the NBA? After all, if no one has ever been as consistent in three point shooting how can they make the claim they are superior? Steve Kerr doesn’t want to settle the debate, though some can make the case for Kerr. Highest three-point shooting percentage for a career: .454, Steve Kerr. But Kerr said in an interview not to put him in the class with Korver. Kerr is an admirer of Korver’s. “What I like is he came into the league as a really good shooter and really perfected his craft,” said Kerr. “There’s a lot of Ray Allen in him in his routine and approach. I talk to (Hawks general manager) Danny (Ferry) about him and he raves about his professionalism and how he works. Kerr isn’t exactly ready to go there. But he’d probably have Korver in the conversation like the rest of us. Kerr, who is now a TNT broadcaster and long of student of shooting which provided him a great and unlikely NBA career, has studied shooters for years. He says when he came to the NBA he was influenced by shooters like Mark Price, Craig Hodges, Jeff Hornacek and John Paxson. He said those were players he played with and could study. Can anyone pick a best? Though at the same time Kerr isn’t ready to declare Curry the alltime best given his few years in the NBA. Some of the others he mentioned in no particular order for a potential Mt. Rushmore of shooters were Mark Price, Ray Allen, Steve Nash, Dirk Nowitzki, Reggie Miller and Larry Bird. Can anyone truly select the best shooters of all time? There are various categories of shooters and often separated by eras. Before the 1980’s, the game was much different with many more big men, a game that played inside first and wasn’t driven by outside shooting as it is now. There also was considerably more contact allowed against shooters than there is now. Players also couldn’t be specialists as much as they can now. There weren’t many Ray Allen/Reggie Miller types in that era. Jerry West came to be known as Mr. Clutch for his shooting. But he also had to run the team and do so much more. Like LeBron James, who has become a much better shooter. James does so much as a scorer to be considered just a shooter. Maybe it’s also why we don’t carve more faces on Mt. Rushmore. Perhaps another, though in a warmer climate and more accessible with better restaurants. So perhaps two top 10 lists as a bonus to celebrate the K-man. 1. Ray Allen: Mr. Pure. Sort of the if you needed one shot guy. He only added to an amazing legacy with one of the great shots in Finals history to win Game 6 and save the Heat’s 2013 Finals. 2. Reggie Miller: Just barely behind Allen. Remember, these are not the greatest scorers but the greatest pure shooters, the guys you want to take first in pop-a-shot and bring to the carnival with you. 3. Larry Bird: His win in the inaugural All-Star three-point shooting contest is one of the great Bird stories of all time, coming into the locker room with the best shooters in the game and announcing, “Who’s finishing second?” Nobody ever shot and talked better simultaneously. Yes, even better than Reggie. 4. Chris Mullin: Not quite with Allen, but similar with a picture perfect stroke. No one ever seemed to move more slowly without getting caught or blocked, another textbook artist. 5. Mark Price. Probably also ran the best pick and roll ever with Brad Daugherty. One of the best free throw shooters and now one of those shot doctors. Amazing sub-six foot shooter. 6. Stephen Curry: Maybe one day he moves to the top. He doesn’t have the resume quite yet given not enough years in the league. His percentage isn’t the highest because he shoots so much and handles the ball and has the defensive attention. But capable of the most amazing shooting games like in Miami this week and New York last season. 7. Glen Rice: Big man who could get the shot off over anyone. Another player with a great stroke who also was a big time scoring leader. 8. Kyle Korver: Not the volume of players like Rice or Curry or Miller or Allen, who are starters and major scorers for their teams. But going 100-plus does mean something. Teams don’t like you breaking records against them, and yet he keeps doing it. Hard worker who runs the baselines relentlessly like Miller did. 9. Kevin Durant: Has surpassed Dirk Nowitzki as the best big man shooter ever given his range. Maybe the most unblockable shot ever and you wonder, if anything, why he doesn’t take it more. 10. Peja Stojakovic: Apologies to Dirk, but these are the best pure shooters to come along. You can make a case for Dirk, though not with the range of these guys. It’s heady company with Nowitzki and Drazen Petrovic, but they probably didn’t have quite the stroke of Peja in his prime. It’s always tough to leave off others with a terrific shooting strokes, like Nowitzki, Steve Nash, Dell Curry, Eddie Johnson, Dale Ellis, Allen Houston, Jeff Malone, Tom Chambers, Steve Kerr, Mitch Richmond, Dennis Scott and Chuck Person. But what about the guys who never got in the highlight shows? 1. Rick Barry: One of the most controversial and outspoken figures in the game, but also one of the best and not only a great shooter but big time player. 2. Calvin Murphy: Little man with a big shot who was sort of a Nate Robinson type in his day though with good shot selection. 3. Lou Hudson: Such a sweet stroke he earned the nickname, “Sweet Lou.” He teamed with Pete Maravich, also a terrific shooter but so much more, for perhaps the most entertaining backcourt in history. 4. Bill Sharman: Set all the early NBA records for shooting as a classic marksman of the day who studied the game and made the shots. 5. Oscar Robertson: Never thought to have the range because he always figured a 10-foot shoot was better than a 20-foot shot and could get anywhere on the floor he wanted. And did. 6. Jerry West: Mr. Clutch, maybe the original big shot maker in the game as you had to be in that era an all around scorer as well. The NBA logo is said to be his model. I’d like to have room for his partner, Gail Goodrich, who was a smaller version of Mullin. 7. Louis Dampier: Played his entire career in the ABA and one of the few to play all nine ABA seasons. By far the league’s all time three-point shooting leader. 8. Bob McAdoo/Ernie DiGregorio: Probably more McAdoo, one of the best ever big man shooters. But it was quite a show when Ernie was on as a shooter in a long forgotten blaze of fun. 9. Fred Brown: Yes, downtown. One of the great get hot streak shooters. Maybe not one to rank with this group for longevity, but also an exciting shooter of his era. 10. Paul Arizin: The percentages weren’t good in his era, nowhere near to match with now. But he effectively got it all started as the first player to regularly practice the jump shot.